March Madness is officially upon us and the 2019 NCAA bracket will feature plenty of upsets, just like we've seen in the past. In the history of the NCAA Tournament, there have been five double-digit seeds that won their region. Four of those were 11-seeds, including Loyola-Chicago last year. Sister Jean's school barreled through March Madness, ousting heavy-hitters like Tennessee and Miami along the way. This season, the 11-seeds are a compelling mix of mid-majors and power-conference schools. Belmont, Ohio State, Saint Mary's, and Arizona State, which won its First Four game on Wednesday, will all be hoping for their One Shining Moment. Standing in their way are titans like Duke, North Carolina, Kentucky, and Gonzaga. In order to figure out which Cinderellas will shine in the 2019 NCAA Tournament bracket, you're going to need some unbiased advice. So, before you make your 2019 NCAA Tournament predictions, see the March Madness bracket picks from the proven computer model at SportsLine. Last year, SportsLine's computer simulation nailed some massive upsets, including huge wins by No. 13 seed Buffalo over No. 4 seed Arizona, No. 11 seed Loyola-Chicago over No. 6 seed Miami, and No. 10 seed Butler over No. 7 seed Arkansas. Now, SportsLine's advanced computer model has simulated the entire NCAA Tournament 10,000 times to come up with the perfect 2019 NCAA Tournament bracket, and find out which teams will pull off the biggest upsets. You shouldn't even think about making a pick without seeing what their model has to say. What they found: No. 8 seed VCU falls to No. 9 seed UCF in the first round. 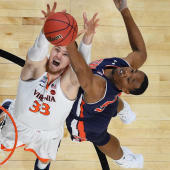 The Knights take this matchup outright in over 60 percent of simulations, making it one of the computer's highly confident 2019 March Madness picks. The Central Florida Knights dropped their regular-season finale and then were bounced in the AAC Tournament by Memphis. However, prior to that they were playing their best basketball of the season during a stretch in which they won seven of eight from Feb. 10 through Mar. 7. UCF's lone blemish during that span was a loss at Cincinnati, but the Knights promptly avenged that loss with a home win over the Bearcats and a win over Houston on the road. The model knows that stretch proved how dangerous the Knights can be and why they will be an extremely tough out for VCU on Friday in Columbia. The Rams have a rotation with just one player who stands taller than 6-foot-8, and that's Michael Gilmore, who only plays 7.2 minutes per game. That's not ideal against a UCF squad that starts 7-foot-6 Tacko Fall and 6-foot-11 Collin Smith. Add 6-foot-9 Chad Brown off the bench and the Knights have a towering, imposing frontcourt that could dominate the game. That trio averages 23.8 points, 17.7 rebounds and 3.8 blocks and could put up eye-popping stats against an under-sized VCU squad. Another huge curveball: No. 3 seed LSU falls in the first round to No. 14 Yale. The Bulldogs won their third Ivy League Tournament over arch-rival Harvard on Sunday, earning revenge after two losses that kept the Bulldogs from winning the regular-season title. James Jones' team plays fast (44th in the nation in adjusted tempo according to KenPom) and can score in a variety of ways. Yale receives balanced scoring from its guards, off the wing, and in the frontcourt. Miye Oni leads the team with 17.6 points and 3.6 assists per game. As a physical 6-foot-6 shooting guard, he is also second in rebounds with 6.3 per game. Alex Copeland, Blake Reynolds and Jordan Bruner also average double-figures and all four can stretch the floor, as Yale shoots 37.2 percent from beyond the arc. The Bulldogs will use their deadly shooting to space the floor and attack the rim, which could be a major problem for an LSU team that has dealt with foul trouble in its frontcourt with Naz Reid and Kavell Bigby-Williams. That's a big reason why the model is calling for 14-seed Yale to pull the stunner against 3-seed LSU. SportsLine's model also has one region where you need to pick the Nos. 11, 12 and 13 seeds, and another region with a No. 3 seed in the Final Four. Nailing those picks could literally make or break your bracket. So what's the optimal NCAA Tournament 2019 bracket? And which underdogs shock college basketball? Visit SportsLine now to see which No. 3 seed makes the Final Four, and see which region you need to pick the 11, 12, and 13 seeds, all from the model that's nailed 12 of the 18 double-digit seed upsets the past three years.